Learn how to tune your rope tuned djembe. In this lesson you will get step by step instructions on how to create diamonds with the extra rope on your drum in order to tighten the drum head. 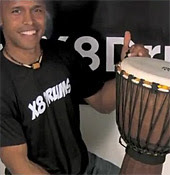 Understand what a tuned djembe should sound like and get advanced instructions on how to create a second row of diamonds for drums that need extra tightening. Lastly you will learn how to wrap the extra rope around your drum once you finish tuning. Instruction by Kenya Masala. --------------- This video is instructed by Kenya Masala.